Lot 1796 Lovely Malaya States Specialized Collection on quadrille pages in a binder, with stamps from Johore to Trengganu, mainly all pre-1941. Total catalogue value is high, but there are some faded colours, so examination is recommended. 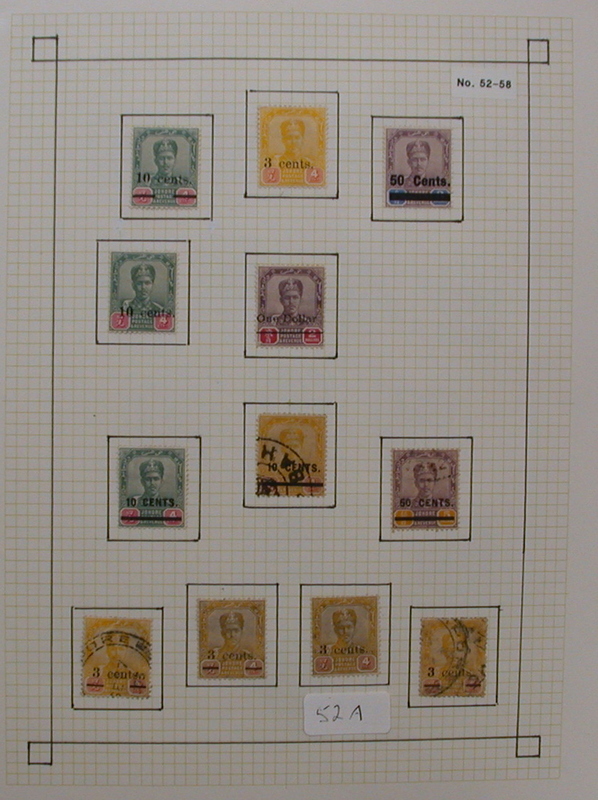 There is duplication, but generally it is to show shades and different cancellations. There are covers scattered throughout. Many stamps cataloguing $100 and the pages with State name overprints from Johore, Sungei Ujong, Perak and Selangor have been scanned. A clean and comprehensive collection, not often seen. (Page 1) (Page 2) (Page 3) (Page 4) (Page 5) (Page 6) (Page 7) (Page 8) (Page 9) (Page 10) (Page 11) . Estimate $500, sold for C$1,450.00 plus 15% buyer’s premium. Here is a strong realization from the British Commonwealth Section. When we estimated this at $100 we clearly did not anticipate the demand. We received seven advance bids and opened it at $700. The internet attacked our top book bid and up it went to sell for a hammer of $1600 which was $400 below the top bid. We know from the questions people ask us that there is both a lot of curiosity about how auctions are run, and there are also a lot of misconceptions. In Auction #7 we had 1846 lots and before the auction started we received from traditional sources like mail and also the internet a total of 7140 bids or very nearly four bids for every lot. That is an impressive total. If a mathematician was asked to randomly distribute numbers into 1846 categories, the distribution would look nothing like the actual distribution in the bidbook. I gave these figures to an experienced auctiongoer who is conversant with mathematics and asked him to guess how many bids were received for the lot which received the most. His answer was 41; the correct answer is 12. How many of the lots received no bids prior to the auction? I didn’t count but it was about twelve or a bit more. How many received ten or more? Also about a dozen with one at twelve and a handful at eleven and ten; nine was not much higher but eight bids was a significantly larger figure. The two “flattest” sections with very few highs and lows were the Healy Pass collection and B.N.A. In those two sections virtually every lot received three, four, five, or six bids. Where did the bids come from? The top five countries were Canada, USA, Singapore, U.K., and Cyprus. After the auction when we look at who was successful the top countries were Canada, USA, U.K., Singapore and Norway. The USA is catching up to Canada, and the U.K. is typically third or fourth. How many bidders came from the internet and how many from other sources (live on the floor, mail etc.)? There was a total of 540 different bidders, 283 came through the internet. However there were a few dozen bidders who both gave us advance bids and bid on the internet; or were on the floor for part of the auction and on the internet for part. It would take too long to sort it out but it is safe to say that half the bidders come from the internet and half the traditional way. Another thing which is important is that many of the longer invoices were from bidders who used the internet AND a traditional venue. How many “stink” bids did we get? Some people put in a “watching” bid on the internet and are perhaps prepared to pay the full estimate and “watch” it by bidding $2; then if the lot opens above the estimate we see no further bid. It is a subjective call whether a low bid is watching or is a bid where someone hopes that no one else will bid on the mint $5 Jubilee and he will buy it for a tiny fraction of its value. If we isolate stink bids, the number is very, very low and perhaps under one percent. All of these figures (although possibly boring to many!) tell consignors that there is an active market and all types of philatelic material can attract enough bidding that usually full market price will be realized. To our bidders: don’t despair, there are still bargains to be had! During the next few months we will update you on the consignments for the next auction which will be in the Spring. We have already received an amazing amount only three weeks after Auction 7. Check back here regularly for news.